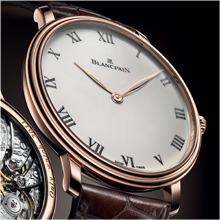 Blancpain, first watchmaking brand to unite its forces with the Monaco Association against Muscular Dystrophies, renews once again its support with the presentation of an exclusive edition of the Villeret Grande Décoration especially created for the charity auction Only Watch 2011. This event co-organised by the Monaco Association against Duchenne Muscular Dystrophy and the Antiquorum auction house, under the high patronage of His Serene Highness Prince Albert II of Monaco, will put up for bidding 39 exceptional timepieces created by the most prestigious Swiss watch manufacturers. The auction will take place on September 22, 2011, in the context of the Monaco Yacht Show and the collected funds will be entirely dedicated to support medical research on Duchenne muscular dystrophy. This highly debilitating neuromuscular disease affects one on 3500 boys – approximately 250’000 children, teenagers and young adults around the world. Blancpain shows its uninterrupted support since 2001 when it was the first watchmaking brand to commit itself to this noble cause. After having participated in all seven events organised since then, the Manufacture in Le Brassus reaffirms once again its support by unveiling an exceptional watch especially created for this year’s Only Watch charity auction. 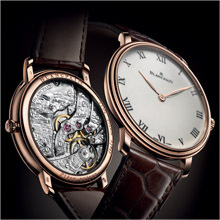 The Villeret Grande Décoration for Only Watch 2011 is an outstanding exercise in style distinguished by vivid contrasts. 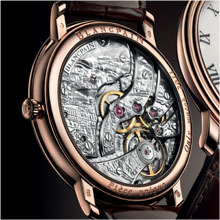 It is equipped with Calibre 15B, an ultra-thin hand-wound 117-part movement stemming from the pocket-watch in the same collection and indicating the hours and minutes. The cambered grand feu enamelled dial covering it bears only 12 painted enamel hour-markers and two hands in the same red gold as the 45 mm case housing it. The extremely pure design of its dial is counter-balanced by the incredibly refined decoration of its movement. Thanks to the slightly thicker bridges of Calibre 15B, Blancpain’s masterengraver Marie-Laure Tarbouriech has given free rein to her talent in creating an original decor for an exceptional timepiece. Entirely hand-crafted by Marie-Laure who has recently received the prestigious Meilleur Ouvrier de France distinction, this exceptional engraving of a typical Monegasque scenery represents the Rock and its hinterland.